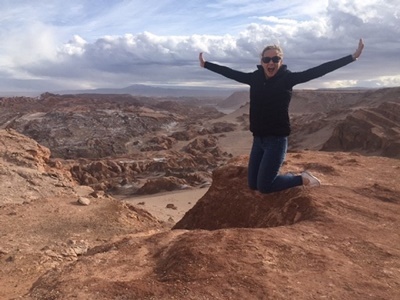 Mobile Travel Agents’ Sarah Smith jumping for joy while visiting northern Chile’s Valle de la Luna (Moon Valley) best known as the place where NASA tested its Mars Exploration Rover before shooting it off to the Red Planet in 2005. Part of a ‘Contours Chile Study Tour – Most Valued Agents Program’, Sarah’s busy itinerary also included hotel inspections walking tours and cookery classes while in the capital Santiago de Chile and port city of Valparaiso. Tour highlights included a visit to the Atacama Desert and a stopover at the world-famous Santa Emiliana Winery in the Casablanca Valley and an opportunity to sample some of Chile’s finest wines.